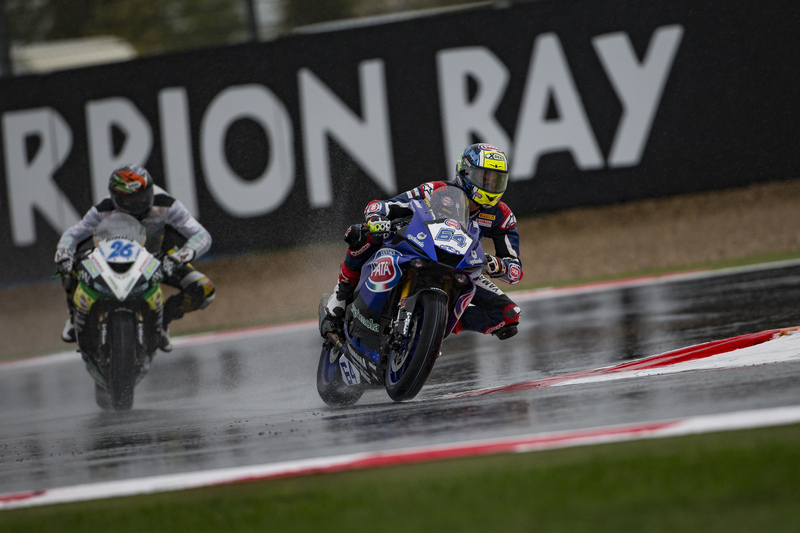 The GRT Yamaha Official WorldSSP Team came through a wet and tricky Saturday at Magny-Cours, France, round ten of the 2017 FIM Supersport World Championship. Federico Caricasulo adapted to the damp track in SP2 brilliantly to secure fourth position on the grid for Sunday’s race. His teammate Lucas Mahias, who was 0.599s quicker than the rest of the field in Friday’s dry practice, will start from 12th on the grid after a technical issue with his bike saw him only able to complete one lap in qualifying. Caricasulo ended Friday’s dry practice sessions in third overall and immediately got to work to try and find a good setup in the wet conditions that greeted the riders on Saturday morning in Magny-Cours. A small crash in the 15-minute FP3, while he was pushing to find the limit, meant he finished in 13th but the 21-year-old Italian was confident he had found a good feeling with his Yamaha R6. This proved to be true as when the sun came out and the track started to dry for SP2 in the afternoon, he was one of the quickest riders in the damp conditions. Improving his pace lap by lap in the session, he set a 1:44.105 on his fifth lap that was good enough for fourth position and was on an even quicker lap when the session was ended early after a nasty looking crash for championship leader Kenan Sofuoglu. Despite being denied the chance for his maiden Yamaha WorldSSP pole position, he is confident of his pace for Sunday’s race after impressing in both the wet and dry over the course of the weekend so far. Mahias arrived at his home round in Magny-Cours trailing Kenan Sofuoglu by four points in the championship standings, determined to fight back in front of the passionate French supporters. He finished Friday on top of the combined timesheets, beating the rest of the field over half a second. Saturday did not quite go to plan for the 28-year-old French rider, although he showed impressive pace in FP3 to finish in third, despite a highside that brought his session to an early end although, luckily, he escaped any serious injury. He was still feeling a bit sore for SP2 but was determined to go out and show just how quick he could be in the damp conditions. Unfortunately, he suffered a technical issue on his bike during the 15-minute session that meant he could only complete one lap before returning to the pits. Therefore, he ended the session in 12th and will start Sunday’s race from the back of the fourth row but, despite this, the 2014 French Supersport Champion is confident of his ability to be able to fight for the podium in Sunday’s race whatever the conditions. The big news to come from Saturday was that after the crash that brought a premature end to SP2, his title rival Kenan Sofuoglu was declared unfit with a pelvic injury and will be forced to miss the rest of the race weekend. Kallio Racing’s Niki Tuuli secured pole position and his teammate Sheridan Morais qualified in second to complete a Yamaha 1-2 on the grid, meaning there were three R6s in the top four, showcasing the pace of the 2017 machine. The GRT Yamaha Official WorldSSP Team return to action on Sunday morning at 9 am for Warm Up, with the 19-lap race due to start at 11:30 am. Check out the SP2 results.